those scarves and tops you've had your eye on! gorgeous new fabrics and sizes. New tees and tops, too! of a very special event at VIDA. Shop now to scarf up some very special savings. This generous offer expires midnight of May 31st, PDT. reading and writing, via Literacy for Life. Till next time, keep living beautifully. Offer expires midnight of May 31st, PDT. 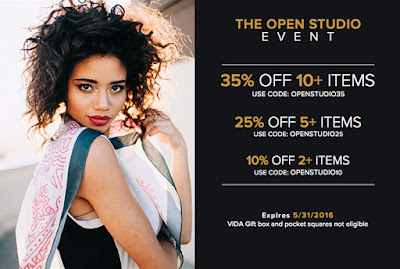 VIDA Open Box & Men's Pocket Squares not eligible. And I have been listening to many Joan Baez songs on YouTube. Beautiful voice. Wonderful messages. That you're a special person through and through. The earth, before it's pillaged and is wrecked. And urge us to assist them with our best. To change our world for better, like we should. In one of the linked articles, I especially like item #6: take a walk outside. But with my recently diagnosed plantar fasciitis, the doctor has told me to stay off my feet as much as possible. I also like #8: write a gratitude list daily. That I can do, and I will -- if not every day, often. Sorry you are dealing with that painful condition. But remember, unless your condition has become chronic, the no walking anthe overall condistion can be a temporary thing. Do all you can to treat it to heal at first, then to rehab your feet. Hoping you'll be in the over 95% of people who get this cured, without any surgery. You are an individual with a determined mindset, and I hope & believe your goal of taking walks will come to be. Well, that's enough for now, other than to say: Thank you, Stephanie, for your uplifting posts. You're very welcome, MikeB. And I thank you. Sending all healing energies your way and may you continue to find the strength to face the challenges of life with grace. Thank you for your good wishes, Stephanie.